Motorbase Performance contested its 250th BTCC at Oulton Park last time out – not that team boss David Bartrum was aware ahead of the event in Cheshire. Bartrum first found out about the milestone during dinner at the track on Saturday evening when many of the faces from the BTCC paddock descended on the Airwaves Racing hospitality unit. Before David had time to work out what was going on a series of tongue-in-cheek interviews were played out over the sound system where the likes of former driver Rob Collard and series boss Alan Gow joked that Bartrum’s team had been a nightmare to work with! 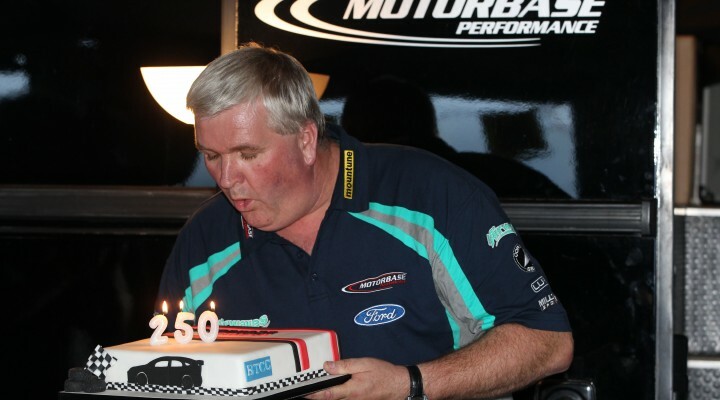 Motorbase drivers past and present, and the full complement of his current squad were also in attendance as Bartrum was presented with a specially commissioned commemorative shirt and cake. The significant milestone was reached the following day in the second race at Oulton, where Mat Jackson scored a top six finish for the team. The team, based near Brands Hatch in Kent, has been competing in the BTCC since 2006. Having raced Honda, SEAT and BMW machinery in the past, it made the switch to Ford in 2011 before going on to build its very own NGTC machines a year later. Overall Motorbase has won 12 BTCC races and scored a further 48 podiums. With the team just two podiums away from a half century and Mat Jackson five starts from his own 250th race milestone it seems there’s likely to be few more celebrations in the Airwaves Racing camp in 2014.